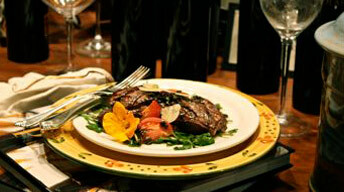 Place lamb steaks in glass dish and coat with marinade. Marinate in the refrigerator for at least 1 hour and up to 6, turning steaks occasionally to marinate evenly. Preheat grill to medium-high heat. Remove lamb from refrigerator at least 30 minutes before grilling to come to room temperature. Remove steaks from the marinade and place on the grill. Cook each side about 2 ½ minutes depending on thickness. To serve: Divide arugula and tomato slices between 8 plates. Top each salad with a lamb steak and drizzle with the vinaigrette. Using a potato peeler, shave some parmesan cheese over each steak. Grind fresh pepper and sprinkle with sea salt as needed. Place all the ingredients except the salt, pepper and sugar in a small bowl. Whisk the ingredients to combine. Season the vinaigrette with salt, pepper and sugar to taste.